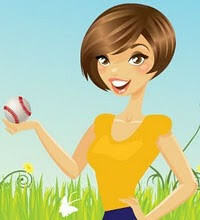 Back when I first started blogging, one of the blogs I read often was having spring garden tour and I decided to join. Hubs and I had just gotten the back yard ready for our Easter party and I was proud to show it off. 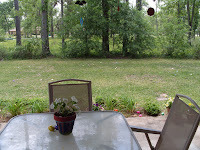 Here is one of the pictures of the back yard looking out my back door. And here is a picture of what it looks like now. I have to admit it, I miss that swing set. The boys would swing and slide and play in the fort. I would push them on thoes swings for what seemed like a sweet forever. 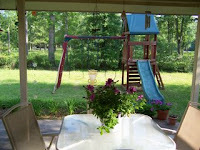 But Hurricane Ike took it out and we have decided not to replace it. They don't really miss it. They have found other things to entertain them, like a big pile of dirt and the water hose. But I miss seeing them play on it. I miss them seeing who could swing higher. I miss watching them slide down the slide only to climb up backwards and slide down again. I just miss that old swing set. "what do kids love more than a playground?" sorry, i watched "parks & recreation" last night. i can see how it would be sad, its almost like they've grown out of it. We watched "Parks & Recreation" last night, too. It's funny. You can certainly tell the creators of "The Office" created "Parks & Recreation." We had a swing set when I was little. They were fun, weren't they? : ) Have fun at your games this weekend. Hope your weather is as delightful as it is around here! Hey - I just stopped by to say thank you for entering the Great Cakes Soapworks giveaway at Fiddledeedee and wish you all the best! We decided when we moved into our current house that we wouldn't have a playset in our backyard because we live within walking distance to the park and the school playground. But there's something to be said for just sending the kids out in the backyard to play! !